By Michael A. Elliott. The University of Chicago Press, 2007. 336pp. Illustrations. Endnotes. Bibliography. Index. This is an unusual book. Although the subject matters are the Indian Wars and George Armstrong Custer, neither features particularly prominently in this work from a historical standpoint as the author, a professor of English at Emory University, Atlanta, is concerned, rather, with the impact on Americans today of the events of June 1876 and their most famous participant. Why is the battle still re-enacted? Why are their specialist organisations studying it? What do Americans today – both white and Native American – think of Custer and his famous engagement? These are the questions he posits in his book. To Europeans even asking such questions might seem bizarre. Last month there was a re-enactment at Waterloo, commemorating the famous battle there 200 years ago. Each July, in the village of Tockwith, Yorkshire, the Sealed Knot remembers the battle of Marston Moor. But the descendants of the participants have no specific contribution to make. In the States, too, the Alamo and the Civil War provide many opportunities for re-enactments. There are specialist research and re-enactment groups for these, so why are there no books on the impact on the attitude of modern Mexicans to the Americans, or the citizens of the former Confederate States to those in the Union? The answer seems to relate to the ethnicity of the protagonists and their current relationships and aspirations, not to the historical significance of the events of 1876. The dust jacket suggests that Custer’s Last Stand retains considerable power in America today but the author supplies little evidence for this. It emerges in the narrative that interest in the subject usually emanated from children’s games of “cowboys and Indians” – no longer played – that the two main specialist research groups – the Little Big Horn Associates and the Custer Battlefield Historical and Museum Association have an ageing membership with few new members – and that the history of the American Frontier is no longer taught as part of the American education syllabus. So are the 300 million Americans today really interested in the events of 1876? In some ways, the book resembles a travelogue – reminiscent of H. V. Morton’s “In the Steps of…” series. Chapter 1 relates the story of the battle but students of the battle will find nothing new (except that Terry offered Custer infantry on June 21 – in fact he offered cavalry; Custer had four companies in his immediate command, whereas most of us thought he commanded five) and covers the development of the battlefield site, including the memorial erected to commemorate the Lakotas who fell there. Chapter 2 looks at Custer’s early life in Monroe, Michigan and devotes much coverage to Steve Alexander the well-known re-enactor who plays Custer and who lives with his wife Sandy in Custer’s home there. Focussing on authenticity he also has a black maid. (Given allegations about Custer’s relationship with domestic staff one’s imagination can run riot here!) Chapter 3 takes us to the Washita and speculates why it has received much less popular attention. Custer’s possible relationship with Monahsetah is also discussed at length and there is a reference to Peter Harrison’s planned biography of her life – it was published in 2014. It seems the national historic site there scarcely mentions a possible relationship. One senses that Elliott is more simpatico to the Sioux and Cheyenne Indians than to their white opponents, a sentiment that is pervasive throughout the volume. By Chapter 4 we are off to the Black Hills and attending the annual meeting of the Little Big Horn Associates, held in 2005 in Rapid City. Elliott met several delegates there and discusses their respective interests. This is all very interesting in one sense, but one is not too sure what conclusions to draw from it. A chapter on the Indian accounts of the Custer fight follows and the book concludes with a chapter on Last Stand Hill and the two main re-enactments held annually along the river and in nearby Hardin to celebrate it, emphasising how the participants – both Native American and white – relate to these. In essence he comments that the two US specialist groups are primarily concerned with the minute details of the history of what happened and why, whereas such matters are of much lesser interest to the descendants of the Lakota, Crow and Cheyenne. The book also incorporates a visit to Wounded Knee and modern native American participation in recent military involvements of the United States as well as a debate on which engagements can be classified as ‘massacres’ and which as battles. Our work Such Signal Success? is cited in the book. Strangely there is no reference to the British specialist organisation, nor to the Westerners movements which have also covered this subject. 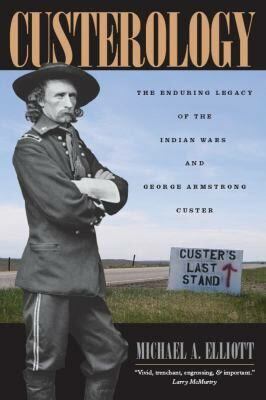 Ultimately, it is not readily apparent that Custer’s Last Stand is more factually understood by the average American than the attack on Pearl Harbor or the Boston Tea Party. As Colonel Graham wrote more than sixty years ago, the Custer known to the average American is a myth. In the past Custer epitomised the military might of the United States imposing Manifest Destiny on the warlike savages of the West. He then became the epitome of the brutal racist suppression of a defenceless, peace-loving, race with troops whose conduct resembled those of the Waffen SS. He (and they) were, of course, neither. There were many other Army Officers engaged in the pacification of the western Plains and also other Government Agencies, notably the Indian Bureau, who believed that providing food and shelter was more efficacious than waging war. Nor were the Indians necessarily peaceable, and internecine strife between various tribes was endemic. Whilst Professor Elliott discusses their aspirations, this reviewer at any rate is not clear if the Native Americans – or Red Indians as we used to call them – secretly aspire to return to the “good old days” when they could hunt buffalo and make off with women and ponies from other tribes, or alternatively settle down as individual citizens of the United States who happen to share the same ethnicity and cultural background with others. Perhaps the truth is that some have followed the white man’s road and prospered; others have done so and failed – comments that could apply to people of all ethnic backgrounds. Many of us hanker for the ‘good old days’ – but that is not a clash of cultures – more a reflection of different dreams. An interesting book: enjoyable reading about friends and acquaintances, but not useful for amassing fresh knowledge of the events of 1876.